Several Nigerian soldiers have been killed by suspected Islamist militants in the north-eastern town of Potiskum, an army source has told the BBC. The town has seen days of violence, with 31 reported killed and hundreds of residents fleeing since Thursday. Meanwhile, China has lodged a diplomatic protest against the killing of a Chinese construction worker in the north-eastern city of Maiduguri. Boko Haram is fighting to overthrow the government and impose Sharia law. On Friday, the army said it had detained a senior commander of the group, Shuaibu Muhammed Bama, at a senator's home in Maiduguri, which is where Boko Haram was founded. The claim has fuelled suspicion that politicians are helping the militants. BBC Nigeria correspondent Will Ross reports that the conflict in Potiskum has reached an unprecedented level, with gunfights, bombings and targeted killings. 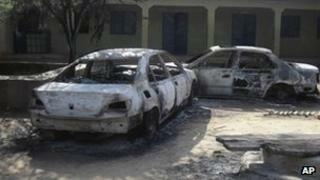 In the latest violence, suspected Boko Haram gunmen hurled a bomb at a military patrol. "Some of our men died during the attack, but the rule is that their families have to be notified first before it is announced," the source told the BBC. An army spokesman confirmed that two soldiers were wounded. On Friday, gunmen stormed the home of a retired head of customs in Potiskum, taking him away with his son and then shooting them both. At least 31 people have killed in Potiskum since Thursday, Nigeria's This Day newspaper reports. Hundreds of residents are also fleeing, but some are stranded because of a shortage of vehicles to take them out of town, reports say. China's foreign ministry spokesman Hong Lei said China paid "high attention" to last week's killing of the construction worker in Maiduguri - the second killing of one its nationals in northern Nigeria this month, AFP news agency reports. The Chinese embassy in Nigeria had submitted a formal protest and "demanded that Nigeria take concrete measures to ensure the safety of Chinese nationals and institutions in the country," he said. Mr Bama was suspected of organising recent attacks in the region, a military spokesman said. The army's claim that the alleged militant commander was held in a senator's house has once again fuelled the debate on whether politicians are helping the Islamist group, our correspondent says. Analysts suggest that some politicians in northern Nigeria are prepared to side with the militants in order to discredit the government of President Goodluck Jonathan, who is from the south of the country, our correspondent adds.